Did your child receive a digital device as a gift over the holidays? Have you been able to prise it out of his/her hands yet? Regular listeners might recall that we did an episode recently called “Really, how bad is screen time for my child?” where we went into the American Academy of Pediatrics’ guidelines on screen time for very young children, so if you haven’t listened to that one yet you might want to go and do it before you listen to this episode, because this one really builds on that one. Yes, we know we’re not supposed to give our babies under 18 months old access to screens. But at some point our children are going to start using screens – and we as parents need tools to manage that process, whether we’ve limited screens until now or whether we’ve been using them as a bit of a crutch. (If you’re in a third category of parents who is totally happy with the amount and type of screen time your children are getting and feel confident about managing this in the future then click along to the next episode, because there’s nothing for you here!) So all of this is what today’s guest is going to help us to figure out. Dr Kristy Goodwin is one of Australia’s leading digital parenting experts (and mum who also has to deal with her kids’ techno-tantrums!). 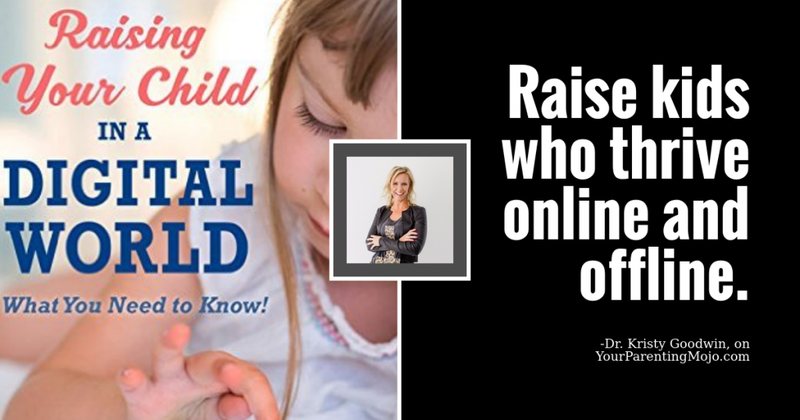 She’s the author of the brand new book Raising Your Child in a Digital World (Affiliate link). Dr Kristy arms parents, educators and health professionals with research-based information about what today’s young, digital kids really need to thrive online and offline. Kristy takes the guesswork and guilt out of raising kids in the digital age by arming parents and educators with facts, not fears about how screens are impacting on children’s health, wellbeing and development. Christakis, D., Zimmerman, F.J., DiGuiseppe, D.L., & McCarty, C.A. (2004). Early television exposure and subsequent attentional problems in children. Pediatrics 113(4), 708-713. Jen: 00:30 Hello and welcome to today’s episode of Your Parenting Mojo, which is called Raising Your Child in a Digital World. Now, regular listeners might recall that we did an episode recently called really how bad his screen time for my child and we went into the American Academy of Pediatrics’ guidelines on screen time for very young children. So if you haven’t listened to that one already, you might want to go back and do that before you listen to this episode because this one really builds on that one. So we all know that we’re not supposed to give her a babies under 18 months old access to screens, but at some point our children are going to start using screens and we as parents need tools to manage that process, whether we have limited screens until now or whether we’ve been using them as a bit of a crutch. Jen: 01:10 And l say that if you find yourself in a third category of parents who’s totally happy with the amount and type of screen time that your children are getting and you feel confident about managing this in the future, then you should just click along to the next episode because there’s nothing for you here, but for the rest of us who are still trying to figure all this out that’s what today’s guest is going to help us do. So Dr. Kristy Goodwin is one of Australia’s leading digital parenting experts and she’s also a mom who has to deal with her kids techno tantrums. She’s the author of the brand new book, Raising Your Child in a Digital World, and Dr Christie arms parents, educators, and health professionals with research based information about what today’s young digital kids really need to thrive online and offline. Christy takes the guesswork and guilt out of raising kids in the digital age by arming parents and educators with facts and not fears about how screens are impacting children’s health, wellbeing, and development. Welcome Dr. Goodwin, thanks so much for joining us. Dr. Goodwin: 02:05 My pleasure. It’s great to be here. Jen: 02:08 So your book outlines seven building blocks for young children’s development. Can you tell us a little bit about what those are? Dr. Goodwin: 02:15 Sure. So I draw on the neuroscience and the developmental science research and they have consistently identified that children have basic, unchanging developmental needs or priorities. And it doesn’t matter where the children were born in 2012 or whether they were born in 1950. Their developmental needs are fairly, pretty consistently the same. So I identified the seven basic developmental needs or as I refer to in the book as the building blocks. And kids need basic things like relationships and attachments. They need language exposure to as much language as possible, both hearing and using. They need sleep, they need opportunities for play, they need opportunities for physical movements, they need good quality nutrition. And the final one is a relatively new one that I’m looking at executive function skills and these are basically children’s higher order thinking skills at the part of the brain that’s responsible for executive function skills is sometimes referred to as the air traffic control system or CEO of the brain. So I draw on what the research because we’ve got a very robust, consistent body of research that says these are the basic needs that children have in order to thrive. And then what I do is look at how technology is intersecting with those basic needs. Jen: 03:36 So I know we’ve, we’ve talked a lot already in the previous episode about how researchers are concerned with children’s screen time. So I, I want to spend a little bit of time on this just to make sure that we’re acknowledging it before we move into some of the more positive attributes. So can you tell us that some of the ways that screen time can hinder children’s development? Dr. Goodwin: 03:55 We do some preliminary research that tells us that excessive or inappropriate use of technology with children can have some adverse effects. In particular, the research has consistently identified but excessive or inappropriately used technology can have implications on children’s sleep. It’s also associated with obesity levels and some research, although not yet consistent, tells us that it has been correlated with attentional issues. This doesn’t necessarily mean that screens cause attentional issues, but there’s definitely a link there. More recently we’re seeing, and again, these are still in the preliminary stages because we need to remember, you know, the ipad is only six years old, and as a researcher in this field, I have to admit, we’re really hopeless at keeping up with the technology. The technology is growing exponentially by the time we conduct, publish, and then disseminate research, the technology is often been superseded. So we don’t yet have, you know, I’m often asked what’s the longterm impact of preschoolers and toddlers on the iPad. Dr. Goodwin: 05:00 I hate to say we really don’t yet know. And in some regards we are conducting a bit of a living experiment. So that’s why I always fall back on what do we know, what does the science tell us? It’s those seven basic things. So we’re seeing with screens in particular, there’s a displacement effect, so when children are using a screen thing, not doing something else. So in particular we’re seeing the early signs that we were concerned about children’s fine motor skills. So children are learning to tap, swipe, and pinch before they’ve learned to grip a pencil and tie their shoe laces were also concerned with perhaps the use of screens to early on derailing or changing children’s brain architecture. We know, for example, in the first three years of life, brain development is predominantly focused on the sensory and the motor regions of the brain. Dr. Goodwin: 05:52 And then from that ages three to four, brain development shifts to that, the prefrontal, where they develop all those executive function skills. And we’re worried that if kids are spending too much time on screens and the sensory and motor regions of the brain, may be under-developed and then we’re placing them in a, you know, an online world that I call it, you know, it’s sensory seduction says things always trying to captivate their attention. Yet, they don’t have the impulse control that’s required in this prefrontal cortex where all their executive function skills…They don’t have those skills yet to manage their attention. So we can see there’s some of the potential concerns. Psychologists are very concerned with children’s self regulation skills that children are not learning how to manage some of their big emotions. Instead they’re being placated by a screen, you know, we give them the digital babysitter to calm them down. Dr. Goodwin: 06:44 We’re also seeing, you know, some preliminary research on the impact of screens on relationships and other relationships children have with parents, not so much because of the child screen use, but even more interestingly, it’s parental use, you know, we’re calling it parental digital distraction and the impact that’s having. There’s one study that’s been published already that’s looked at what they’re calling fractured maternal care. And they looked at rodents because obviously getting ethics approval to do studies like this with humans would be near impossible. But what they’ve actually found is that there’s some adverse social and emotional consequences if the maternal rat was chronically distracted. I’m saying, you know, we’re just, there’s so many potential risks, so that’s why I think it’s always safe to be until we have conclusive longterm evidence, which we gears away from, let’s fall back on, you know, my friends call me Cautious Christy; I always err on the side of caution, do we know what, you know, what are their basic needs, let’s make sure they’re met and if they are met and a little bit of screen time is unlikely to be harmful or detrimental to them. Jen: 07:52 Okay. Okay. That makes sense. I just want to dig into a couple of things that you’ve mentioned. You talked about the correlative link between screen time and attention, and just wanted to clarify that you did say that that’s not causative, but just to clarify for listeners that I think what you’re saying here is that we know that there’s a link between screen time and attention and we’re not sure which causes, which is that right? Dr. Goodwin: 08:15 Absolutely. Definitely A study by Dr Christakis was published a few years ago and um, some of the media headlines as often is the case misconstrued the findings and said that screens, calls add and Adhd, and that is definitely not the case. We do not have the research to substantiate that there is a link, but we’re not sure which direction that link goes from. It goes between. So is it that children with attentional issues gravitate towards the rapid fire fast paced stimulation that the online world offers? Or is it that rapid fire stimulation, that sensory bombardment that controls a two inch totally. We don’t yet know. So I go back to what do we know that the prefrontal cortex, you know, where their executive function skills are developed. One of the key parts of executive function skills, is impulse control, and we know that this part of the brain doesn’t start to peek in its development until about age is four to six. So children cannot really orient and manage their attention. And even then attention management is not fully developed. So potential risks. Jen: 09:26 Yeah, and it seems as though the issue of correlation/causation is also there on that managing attention research, right? We don’t know if the children who have trouble managing their attention are gravitating towards screens or vice versa. And just something else that you mentioned that caught my ear. You said that children are learning to tap, swipe and pinch before they start learning to hold a pencil or tie their shoe laces. Is that a concern or could it be that those fine motor skills that children are developing using a screen time is actually helping them. Which, which way does that go? Dr. Goodwin: 09:59 Yeah, so we’ll put some mixed research there . There was actually a study by the technology company AVG two years ago that said that children literally meet their technical milestones before their physical milestones now. Um, and it’s interesting. I traveled throughout Australia and this year I’m in Australia was the first year of what they’re calling the iPad kindergarten generation and teach us throughout the country anecdotally reporting that children are entering school with poor fine motor skills so they can, you know, not holding a pencil correctly, not able to use scissors. So there is definitely, I would think some sort of displacement effect that, you know, time on screens is eroding, superseding opportunities to develop those skills. However, we have also had a study published that has suggested that actually tapping and swapping, depending on what the actual action is on the screen, that can actually facilitate the development of fine motor skills. So again, it depends on what they’re doing. If an app is specifically designed, there are a couple of apps for preschoolers that I’m aware of that do start to develop some of the pincer group and some other small fine motor skills. But again, and this is where it all comes back to balance, you know, making sure that they get the best of analog and digital experiences as well. Jen: 11:18 Yeah. Okay. So we’ve talked a little bit about some of the potential negative effects the screen time can have on children’s development, but one of the things that I really loved about your book was the way that you address each of the seven building blocks in turn and for each of the building blocks that you’d talk about, not only the ways in which screen time can hinder children’s development in that block, but also how screen time can support it. And I was really surprised to find that there are ways that screen time can support all of the seven building blocks. So can you tell us about some of those more important ways that screen time can support child’s development? Dr. Goodwin: 11:50 Absolutely. So screen time isn’t necessarily toxic or taboo and I think this is one of the issues facing us as modern parents. Unfortunately, if we read popular media, all of the negative attributes of technology is often reported. So we are given a very lopsided view. And as a researcher in this field, I know that there’s a lot of positive potential that screens can offer, again, if they’re used appropriately and intentionally with our kids, so as parents, I think that helps us to ditch what I call the techno guilt, we don’t need to feel bad that accuracy using a screen because there is positive potential. In particular things like language, there are wonderful apps and websites and online tools that can develop children’s oral language skills, both very expressive language and receptive language skills. So in this instance, we need to be looking for apps in particular where it’s interactive, where children can either record their voice or were they can respond to some sort of stimulus. Dr. Goodwin: 12:52 Can you identify a word that starts with the sound “P” and they tap and they get that instant feedback. So there are some great apps. Again, if it’s at your child’s developmental readiness level, that’s really important. This is not suggesting that we need to dunk our kids in the digital world early on to get them ready for Harvard. There’s definitely no rush to do that despite what a lot of app developers will tell you in manufacturing. And that’s an issue on it’s own, you know, parents are under increasing pressure, marketing push up to buy devices that are marketed as educational, especially if there’s a technology slant to them to give their kids the head chance and think we don’t, you know, we don’t necessarily need to do that. We can also use technology to facilitate kids’ relationships. So building relationships. Dr. Goodwin: 13:42 So for parents that either travel for work or have family members overseas or interstate, there’s a brilliant app code Kindoma and it’s basically a storytelling app with two pop up video chat windows within the app and you can read a book in real time with Dad who is inter-state and you can see his face, Dad can zoom in on a page on the book. He can circle, you know, the big bad wolf snout. And on his daughter’s book in another state, the exact same thing happens. So we can start, you know, even video, Skype, video chat technologies can bolster relationships too. So there’s lots of, you know, positive potential, a lot of apps and websites now developing play skills so children can engage in interactive play. The key thing with all of these is something that’s critical for kids’ development and that is what we call the ping pong interaction. In the examples that are provided, the children are very active. It’s very different to a child sitting there passively on their own watching YouTube clips or watching television for hours on end. So that, that interactive aspect is a really critical part. Jen: 14:51 Hm. So how do you go about finding the apps and the programming that, that does have that kind of content? Do you have special sites that you go to to look for those kinds of things? Dr. Goodwin: 15:00 Yeah. Look, I like to keep it simple and I can give you some recommended apps and websites, but the problem with doing that is that list is redundant as soon as I give it to you. So I often recommend that the one app that parents must download the app from Common Sense Media. Common Sense is the nonprofit organization in America who not only reviewed but curate not only apps but websites, movies and television shows, video games. So you’ve got an app literally on call to help you not only source age-appropriate content that they also review content as well. So that’s one thing that I think is a fairly reliable organization. Jen: 15:45 Yeah, I know them as an organization. I didn’t know they had an app though. Dr. Goodwin: 15:48 Yeah, they do. And it’s really helpful, especially if you know you’re at a video store and your six year old son is telling you that Grand Theft Auto is appropriate, you can pull up their view and say, uh uh; I don’t think so. So that, that’s a really, really helpful one for keeping abreast because as I said, the technology’s evolving. Another really great tool specifically for apps, so common sense media, look at the whole breadth of media websites, television, et cetera. But if you’re after an age specific app, I highly recommend the Kinder Town app and website. They have educators reviewing apps so you can source, say you’re after an app for a five year old, um, to develop their number facts. You can go into this APP and drill down and source apps accordingly. Jen: 16:36 Okay. So when we talk about high quality and in an APP is the the amount of interaction that the children are having with the APP, it kind of the primary indicator of that, and I guess the fact that they’re aren’t people killing each other, you know, how do you judge the quality of an APP? Dr. Goodwin: 16:51 Yes. So there’s some key things that you should look for and you’ve touched on what I think is one of the most essential that the fact that the child is active as opposed to being passive. So that’s the beauty of particularly touch screen technologies offer young children is the fact that they can engage and interact. So it’s obviously more cognitively engaging than sitting there watching a television show or a DVD. That’s not to say that, you know, television and videos aren’t educational, but it’s the interactive element that’s really pretty cool. We also for young children want to look for apps that develop language skills. So we want them to be hearing and using high quality language as well. We also want to make sure as you suggested to that it’s the content and content really is king. So what a child does with a screen is really, really important. So looking again for content that is both accurate and educationally appropriate as well. Jen: 17:46 Okay. So we talked a little bit about quality, and my major concern is not that you know, that there aren’t quality programs and apps out there because I believe that there are, but my concern is more about quantity bench that um, so can we start by talking maybe a bit about what it is about technology that makes our children crave it, you know, and do children really get addicted to screen time or is it just that they, they like it too much or what’s going on with that process? Dr. Goodwin: 18:17 Okay. So it’s really interesting because we, we are captivated by the screen. So there are really five main reasons why kids become very attached. And I’m reluctant to say addicted. I don’t think the research tells us that kids can be addicted until they’re at least 8 years of age. I think up until about eight children can definitely form an attachment, a dependence on technology. I tend to describe it as unhealthy relationships. Jen: 18:45 Okay. Sorry to interrupt. Are you reluctant to say addiction because there’s a clinical definition of what addiction means and you don’t believe that children are meeting it? Dr. Goodwin: 18:53 That’s right. Okay. One of the key distinctions with the clinical definition of addiction is that the person makes a conscious choice to engage in whatever the unhealthy behavior is aware of what the adverse consequences are, and I don’t think young children can actually understand what the adverse consequences are. I don’t think they have the self regulation and emotional regulation, so I think up until eight, and I mean I’ve seen incidents, instances of young children very, very attached to their screens, but I don’t think we could label it as addiction because I think we still have a lot of parental control in most instances, up until eight years of age. So we can help to redirect and reshape some of their unhealthy behaviors. So I like to explain why kids find it so hard to switch off screens and why they become so fascinated and obsessed by them. Dr. Goodwin: 19:45 This is why I often talk to parents about why you get the techno tantrum. This helps to explain why you get the, you know, the emotional meltdown or emotional combustion when you ask for your iPhone back or for the television to be switched off. It’s also predominantly the same five reasons why we as adults find it hard to turn off our devices. So at kids’ brains are actually undergoing a neurobiological change when they using a screen. And one of the main changes that we see, and this is why technology is so captivating, is that technology is usually a pleasurable experience for our kids. So their brains secretes the neurotransmitter dopamine, which makes them feel really good, which is where they want more and more of it. So mom coming in and asking for her tablet back old, the television to be switched off is not going to be met with a positive response because you’re cutting off their dopamine supply. Dr. Goodwin: 20:35 So dopamine is one of the main reasons. The second reason is that kids often into what we call the psychological state of flow. So when they start to use screens, they lose track of time. As adults, we often get into this state when we’re engrossed in our work or the cooking or perhaps gardening, and our kids literally lose track of time. So you could have given your children a time limit, you know, you’ve got half an hour on, on the TV, then I’m going to turn it off. They literally lose track of time. So again, why you get the techno tantrum at the end. And that’s one little side tip here, I often don’t recommend under the age of six, giving amounts of time as a limit only because young children don’t understand the abstract concept of time instead, especially for under six year olds, I usually recommend giving a quantity. So you can watch two episodes of Peppa Pig today and then we’re going to turn it off. For older children it might be, you can get to level three on the game and then I want you to turn it off. So giving them a quantity as opposed to an amount of time can work well. Jen: 21:38 And that seems as though makes sense where there is a defined end to the thing like a peppa pig episode. But what if it’s like, I mean, I’ve actually never played Minecraft. In fact, I’ve actually never seen minecraft, but from what I understand, it is sort of a game that just kinda keeps going and going and going. So how do you manage it where there is no natural break point? Dr. Goodwin: 21:58 Really good point. So I’m with Minecraft, there’s two ways that I recommend, depending on what format they’re playing, if they’re playing in a format, each sometimes transitions between day and night. So saying to your child, okay, the next time it goes from daytime to nighttime, I want you to finish, and that gives them more of a clear cutoff point. The other thing I recommend with Minecraft is getting your child to tell you they craft things which is making things in, in this online world and getting them to give you a specific quantity of the types of things that they want to craft. So today I want to craft, you know, six tools when I’m done with that, I’m done. So that you’ve actually lived perfectly onto the third reason why our kids form dependencies and attachments to screens, and I think this is the hardest one for us to manage as adults as well. In the online world, we enter something called the state of insufficiency. It’s this feeling that we’re never ever done or finished. You know, YouTube is, you know, like digital candy for kids so much that can pique their attention and interest. Television channels now you know the news, literally no finite finished point. Never ever feel dumb. You know you don’t like an app, you hit the home button, you find something else. You’re on the Internet. Something doesn’t appeal to you. Open up another browser. Jen: 23:17 And your Facebook screen scrolls forever and ever and ever and ever…. Jen: 23:50 You get your little dopamine hit at the end. Dr. Goodwin: 23:53 They’re not in a way. It is literally, you know, chasing an endless goal. There is no finite point and that’s really hard for kids, especially when there’s so much appealing, like captivating their attention. So the fourth reason is that the prefrontal cortex, I’ve talked a lot about this today, but their part of their brain that’s responsible for all their higher order thinking skills is actually wired for novelty. So in years gone by, it helped to keep us safe. You know, if we’re always looking for new and interesting things, it kept us kept danger away. But in the online world, there are so many sensory seductions that it’s captivating, it appeals to that sense of novelty. The real world, you know, outside in nature doesn’t offer that same level of novelty, constant novelty too. Jen: 24:43 And this is not an accident, right? The people who do these apps know these things. Dr. Goodwin: 24:49 Okay? And this is why I often talk about balancing green time and screen time. Getting kids out in nature is more important than it’s ever been. Why? It helps to slow down their brains, it helps them to appreciate, you know, not everything in life results in instant gratification. So, so really important that they get that balanced approach. And the fifth reason, this one doesn’t appeal to us as much as adults. It can with some adults, but for children in particular, one of the main reasons that we get the techno tantrum or that they find it so captivating being online or with technology is that their sensory system gets bombarded. They know the system is a wash. You know, I heard someone explaining it the other day and they said that it’s like getting a cup and trying to fill the cup up with a hose at close distance. Dr. Goodwin: 25:40 And that’s what’s happening to their sensory system. You know, their nervous system as well. Like getting this, this is high levels of stimulation. This is why you often get the techno tantrum, or the abhorrent behavior after they’ve been on a device. It’s literally the nervous system and sensory systems trying to calm down and process what they’ve seen. So it is normal. I think it’s important to reiterate, you know, if your child has the techno tantrum and wants to use the technology, if I, if we can reframe it and think, you know, it’s their neurobiological changes in the brain. It helps us to at least appreciate. Jen: 26:17 It’s not that they’re just being awkwardl it’s literally something in their brain has changed and they want more of that domain or you know, they want to, they really need to keep going in whatever they’re doing. Dr. Goodwin: 26:30 That’s right. Jen: 26:30 Okay. Okay. So that, that’s really helped me to understand a lot of the issues why children just want to keep going. And to me it’s sort of, it makes me feel doubly grateful that I haven’t yet shown my daughter an app. She doesn’t know the apps exist yet, and I know she’s going to have to at some point and I was just reading in your book before we started talking about, um, you know, there’s a great app that helps kids understand the human body and she’s super interested in bones right now and she’s always pinching her arm. She’s like, there’s a bone in there. Jen: 27:00 And I’m thinking, okay, maybe I could use this human body app to help her understand a bit more about bones. But then I’m like, but I don’t want her to know the apps exist. So how do we start to navigate that process where we’re introducing screen time to our kids because, because it has educational value and value to a child’s development. In our previous episode and also in your book, we talk about having a family media plan, which I can see is a great tool for slightly older children who can have that conversation about, you know, what do we think is reasonable and let’s come to an agreement. But what about two and a half, three year olds who don’t seem to be ready to have that kind of conversation yet, how do you start to navigate that? Dr. Goodwin: 27:42 When do we start to talk to kids about screen time? And I said the minute you hand over your smartphone to your toddler and they choose to do that, yes, the minute you start having obviously very informal, but having really clear expectations. So whilst you may not be communicating your family, maybe a plan to your two year old or three year olds having it formulated, at least in your head with your partner or with other caregivers, I think that’s really important because establishing those limits early on is essential. I often use the analogy that if you were to plant a tree in your backyard and realize that you didn’t want the tree there after a couple of months you could easily transplanted to another part of your garden plant, it would probably take off and everything would be fine. However, if you were to leave the tree there and let it establish its roots, to transplant it in a couple of years time would be a lot more difficult. Dr. Goodwin: 28:37 So if you establish healthy media habits early on, yes, you will still probably get the techno Tantrum, but consistency over time will help your child to build those really important skills and, and healthy habits. So I definitely think parents can come up, obviously not necessarily articulating that to kids, but coming up with a media plan that they feel comfortable with and other children interacting because that’s key too. If, you know, grandma lets me have the iPad for two hours, it’s really hard to come back to mom and mom says, no, you can’t have it. So that, that consistency is important as well. But again, looking beyond the, how much, also looking as, as you’ve already discussed, you know, what are they, what do you want them to use, what content do you think is appropriate; when, what times of the day you don’t often recommend avoiding screens, particularly around nap and sleep time for children, adults as well. But children are a lot more susceptible. Jen: 29:33 Why is that? Why do you recommend that? Dr. Goodwin: 29:35 So the research tells us that the use of screens, particularly backlit devices like tablets and smartphones and meet blue light and blue light suppresses the body’s production of melatonin and melatonin is what children in particular need to help them fall asleep quickly and easily. And we all want that. Jen: 29:55 Yes we do. Dr. Goodwin: 29:58 So we know that the use of screens, particularly in the 90, some research says 60 minutes, but most of the research is saying the 19 minutes before that designated sleep time, can delay the onset of sleep and over time they sleep delays. What some of them coming in, I’d be 10 minutes, some of them can be half an hour, an hour. Those sleep delays can accumulate into a sleep deficit and I don’t need to tell parents that kids tired kids, I really difficult kids to be around. We also know it has huge implications on their brain development and physical health and wellbeing as well. So sleep is one of the critical building blocks that I mentioned in the book. So we have to have really clear guidelines as families around when I’m also establishing healthy habits, you know, are devices OK at the dinner table, um, are you a device free family? Dr. Goodwin: 30:50 I also recommend that, um, in addition to what and when kids are using screens also considering where are you happy for devices to go? So I recommend families established tech free zones, so some of the places are recommended the meal table, so wherever you eat meals should really be device free. I’m not just because of the communication factor, but also we know that children’s taste palates are changing if they’re eating screen dinners. Dr. Goodwin: 31:17 So true. Yeah. Really interesting. I interviewed some pediatric nutritionists and they are reporting anecdotally at this stage and that they’re trading increasing numbers of children with taste preferences and sensitivities because they’re not mindfully eating. They don’t want to chew on, you know, a tough piece of meat and really consciously eat it if they’re watching a screen because their sensory system is diverted. Eating is the second most cognitively challenging task and young child has to undergo. It draws on all of the sensory systems. So your, your touch, your smell, taste sight, etc. And if some of their attention is diverted to the tablet that’s on the table watching, you know, displaying a television show, they’re nervous and their sensory systems are diverted. Jen: 32:07 Wow. I thought you were going to say that it was going to allow me to slide some more carrots in there because the child was distracted and might not notice the vegetables going in. Dr. Goodwin: 32:18 Because some parents, that’s often how it starts and parents do that and they child initially will be because they’re distracted, will eat and not mindfully eat, but the minute it takes a little bit more conscious effort to chew, and we obviously want our kids to have a full taste palate as well. So it’s that, that was a really interesting a discovery. So when we’re, sorry, it’s our dinner tables. Bedrooms are definitely a tech free zone play spaces. So wherever your child’s playing should ideally be technology free. And cars. We want to teach kids from a young age that, that cause I’m almost like, I’m aware that sometimes road trips people want to use, you know, something to distract kids and I’m fine with, with that. But more often we want children to have device free time in the cars because literally you’ve got them trapped. It’s a great place for conversation. So you can engage in the conversation, but also teaching them about distraction we’re seeing…we’ve got a big campaign here in Australia about distracted drivers. Um, so we’re teach again those healthy habits. Think of that tree analogy, establish the habits early on, and they’ll be count entrenched healthy habits. So yeah, just coming up with a plan that you’re comfortable with that the other children that interact with your child comfortable with and being consistent with that. Jen: 33:43 So you talked a lot about the places where children shouldn’t be using screens. Where do you let your child use screens? Is it mostly at home? Dr. Goodwin: 33:50 Yes. So for young children in particular, I’m designating specific places in the house where you can use technology. We want them ideally to be in publicly accessible spots, not only so we can monitor, that’s obviously, you know, safety and a precautionary approach is important, but also because we want to engage the, there’s a lot of research that tells us that co-viewing, and I know that you would have mentioned this in the american academy of pediatrics update that the research tells us that co-viewing or joint media engagement is really beneficial for kids. So we want them to see that technology that we’re interested in technology and we value what they’re doing. I think that opens the channels of communication and it sort of takes away the stigma that technology is, you know, a solo sedentary activity that I do in isolation. We really want technology to be seen as a valued experience in the home. Jen: 34:46 Okay. And I, I just want to backtrack a little bit because you mentioned something that caught my ear. you said that eating is tthe second most cognitively challenging activity that children do. What’s the first? Dr. Goodwin: 34:57 The first one in the early years is learning to walk, and eating, and learning language. Is that the hierarchy of the list? Jen: 35:06 Okay, thanks. I didn’t want to conclude without giving listeners closure on that one because I know I was curious. Dr. Goodwin: 35:14 Comes back to…and I know we’re talking about slightly older children today, but that’s why the premature use of screens can derail kids’ development in the early years. They know those first two years of life and again, why the American Academy of Pediatrics have suggested delaying the introduction until at least 18 months because so much of their development requires the sensory and motor regions of the brain to be developed. You know, early introduction will displace those vital movement experiences. Jen: 35:42 Okay. So as we sort of head towards a conclusion, I just want to talk about a tool that I saw in your book that I actually haven’t seen anywhere else. And so I wanted to make sure our listeners to hear about this. So we hear so much talk about, you know, how, how much is too much, but how do we judge how much is too much if, if our child is spending six hours a day on Minecraft, we’re probably pretty sure that that’s too much. But the tool in your book is how to figure out what is a healthy amount of screen time. So not just so you know, completely the opposite approach, not what is too much, but what is a healthy amount. So can you tell us about that? Dr. Goodwin: 36:17 Yeah, so I came up with it because I’m a mom than it needs to be simple and it needs to be practical. So I came up with a single impractical formula to help parents calculate screen time limits based on kids’ developmental needs. So at the start of our discussion today, I talked about kids’ seven basic developmental needs and priorities. So what I like to do is to say that imagine your child has a 24 hour period and that period, 24 hour period is represented by glass jar. So if we were to see that their 24 hour period broken up into their developmental needs, we need to put in those seven basic things, you know, sleep, play, movement, et cetera. once we put all of those in, some of those, we actually do have recommended guidelines. So we’ve got guidelines regarding how much sleep children require according to their chronological age and how much physical activity they require as well. Dr. Goodwin: 37:10 Once we put in those seven basic developmental needs into that glass jar. What we actually see around…I use foam balls. So imagine putting giant foam balls in a glass jar. Then what we can actually see around the outside of the foam balls is white space, that white space could be left just as wide space and I actually recommend that for kids. Kids still need white white space, and unplugged time, but it also means we could fill that white space up with screen time and we wouldn’t have to fret that screen time is damaging, derailing, or harming their development while their basic needs are in the jar first and foremost. but what’s happening in many families is that we empty out that glass jar and what goes in first screen time and screen time starts to fill the jar and then we try and put in some opportunities for them to play in hear language. Dr. Goodwin: 38:02 They don’t meet their basic needs. Um, so I think that that formula works really well and it’s simple and it helps you if you’ve got multiple children, have different chronological ages, it helps you come up with an amount of screen time according to their age as well. Well, the other strategy that I recommend to parents is recognize your child’s tipping point, so for some children, 20 minutes on the iPad can be fine and they’ll come off and you don’t see any changes in their behavior for other children. Twenty minutes on the iPad is just much. So look for their unique, what I call tipping point and, and, and, and adjusted it will change and I like everything was children just when you get a handle on their behavior or the latest challenge you’re facing and you feel confident you know what you’re doing, they will present you with a new challenge. So be willing to be flexible and change the guidelines over time as well. Jen: 38:56 Okay. And just to go back to the glass jar for a minute, you mentioned the recommendations on the amount of sleep and um, can you, can you talk us through, you know, what are some of the other recommendations about the different building blocks and how you put those together and then how you come up with the amount of screen time at the end that’s a leftover amount that could be used. Dr. Goodwin: 39:18 Okay. So we do have recommendations, as I said, for sleep. Depending on your age of your child, most children need somewhere in the vicinity of 10, sorry, 10 to 14 hours worth of sleep a night. So they’d be variation according to their age. but once you start to put that in the glass jar that represents a significant amount of time; they don’t have much of a waking period after that. We’ve also got guidelines regarding how much physical activity children should be engaged in every day. And again, variation; usually between one to three hours of physical activity spread throughout the day. Please, don’t think I’m saying you’ll child needs to be exercising for three hours. But they’re there two that have specific quantitative measures and guidelines. Some of the other ones, you know, I say as much language language rich homes, language is probably one of the best predictors of your child’s academic success. Dr. Goodwin: 40:17 So giving your children as much opportunity to hear and use language is really critical. Again, things like relationships, it’s really hard to give a specific measure and a lot of these, this is where it gets a bit tricky because we’d love if our children, when they are little silos and we could divvy up their day to 20 minutes of language skills; we know that they’re closely connected so it’s hard to give specific amounts for some of the others, but just making sure, I think in the back of your mind, if you can sort of tick off those basic needs every day, you can rest assured the, a little bit of screen time in addition to that is unlikely to be harmful. Jen: 40:53 Yeah. And is it, um, we’ve, we’ve talked a lot about food on the podcast as well and how your children might binge on orange juice and eggs for dinner one night and then the next day they pig out on broccoli or whatever, and if you look at each meal, each meal has a horrific nutritional balance, but if you average it, you know, maybe over the course of the week you see that they’re actually getting the nutrients that they need. Can you approach screentime and that same perspective and say, well, you know, we spent three hours yesterday with grandma having a one on one conversation and maybe learning how to knit or something and today you get a bit more Minecraft. Does that work like that? Dr. Goodwin: 41:25 Absolutely. Yeah, it does. But I would also be careful about being, um, media consumption. It’s really hard for kids to appreciate that as a one off. It’d be very quickly, you know, and it’s appealing. I am saying don’t ever do it, you know, my, my eldest had a period of time while he was really, really sick and there was not much he wanted to do and as adults we binge watch television or whatever, our digital preference is. And so yeah, I think that, that moderation is key. There is a great psychologist in Australia called Jocelyn Brewer and she talks about digital nutrition and I love the analogies and the metaphors that she shares as well. You know, we, we need to make our kids make healthy choices. We need to make sure they’ve got a balance, and if we do those things we can rest assured that technology’s going to be bad for them. Jen: 42:19 Yeah, that makes sense. Thanks so much for spending the time with us today. I feel as though I have some more tools now. I’ve even having had even having read the book, I feel I learned a lot from this conversation about how to actually apply it and make a plan for introducing screen time to a toddler. Jen: 42:45 Super, thanks so much. Well, thanks also to the listeners for listening along with us to this episode of your parenting mojo, and you can find the link to Dr. Goodwin’s book, which is called raising your child in a digital world on my website at YourParentingMojo.com/digital-world, and we’ll also put up the references to the studies that Dr. Goodwin has mentioned today.